Östanbäcks Kloster, Sweden, summer, 1982. 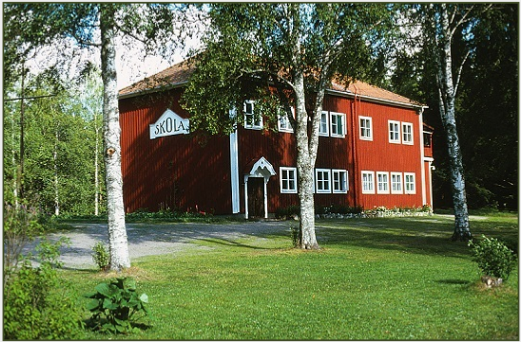 On the side of the monastery a sign with the word "Skola" reminds one of the building's former function as a country schoolhouse. Monks and nuns of the Roman Catholic faith account for the greater number of those following a monastic life in the Western Church. Fostering ecumenicism, Roseman sought to include Anglican and Lutheran monastic communities in his work on the monastic life. In the summer of 1982, the artist and his colleague Ronald Davis, who wrote to the monasteries to introduce Roseman's work and participated in planning the itinerary, traveled to Lutheran Benedictine monasteries in Sweden and to a Roman Catholic Benedictine convent in Denmark. In early July, Roseman and Davis arrived at Östanbäcks Kloster, a two-storied, red-painted, wooden dwelling situated among a grove of birch trees on the edge of a woodland near the town of Sala. On the side of the monastery a sign with the word Skola (School) reminds one of the building's former function as a country schoolhouse. Östanbäcks Kloster was founded in 1970 by Father Bengt and three other Lutheran ministers aspiring to establish a monastic community in the Church of Sweden. 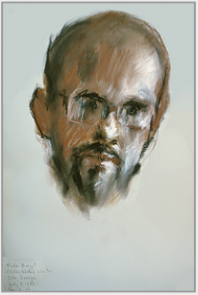 Presented here is Roseman's Portrait of Father Bengt, 1982. The impressive portrait drawing, rendered with chiaroscuro modeling in chalks on gray paper, was a gift from the artist and his friend to the monastery in appreciation for the gracious hospitality and encouragement of their work they received from the monks. As Roseman was writing a text on monastic life and his work in monasteries to accompany his paintings and drawings, Father Bengt thoughtfully provided the artist with a summary in English of the discourse he gave in 1973 at the Conference on the Religious Life, arranged by Societas Sanctae Birgittae in Vadstena. Father Bengt relates that the first missionary period in Sweden dates from 830, when the Benedictine monk St. Ansgar and a fellow religious named Vitmar came to Birka. By the twelfth century, a Benedictine Abbey was founded in Lund, and a century later, Cistercians were well-established in Herrevad, Alvastra, and Nydala. "The two splendid drawings arrived safely and have now joined their fellows. This eloquent drawing was acquired in 1986 by the Teyler Museum, in the Netherlands. The museum houses a renowned collection of master drawings from the Italian Renaissance, including sheets by Michelangelo and Raphael, as well as from the seventeenth-century Dutch School, notably drawings by Rembrandt. More content will be added to this page with a selection of Roseman's drawings from Östanbäcks Kloster and the Lutheran Benedictine convent of Östra Sönnarslövs Kloster, which includes the drawing Sister Elsa in Choir, 1982, in the New Orleans Museum of Art. Also added to this page will be work from the convent Vor Frue Kloster, Denmark. 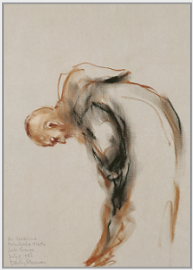 The drawing Benedictine Nun Bowing in Prayer, Vor Frue Kloster, 1982, is reproduced on the website page "Benedictines, Cistercians, Trappists, and Carthusians," Page - 2 "Benedictines." Brother Caesarius in Choir, 1982, (fig. 3, below), was also included in the Albertina exhibition. Brother Caesarius was one of the founders of Östanbäcks Kloster. at the Conference on the Religious Life, Societas Sanctae Birgittae, Vadstena, 1973, p. 1. The present work, beautifully expressed in transparent tonal passages of black and bistre chalks with linear accents on gray paper, depicts Brother Caesarius in his voluminous cowl. Touches of white chalk add highlights on the face of the bearded Benedictine monk bowing in prayer as he recites the Gloria Patri.